Mike McClure, senior account executive and image consultant for Ad Art Sign Company, was one of the inspirations for the #LetsGetSmart17 speaker series, according to host David Perlmutter. Mike is someone who enjoys not only talking about his craft, but also hearing about others' insights into businesses and the future. Ad Art Sign Company is an award-winning national sign company that is primarily based out of California, Nevada, and Texas. Mike started in the sign business as an apprentice sign installer more than thirty years ago. Mike began his talk by discussing broadly how important it is for companies today to constantly adapt to the changing times. As an example, Mike cited Sears and how the company got its start. The Amazon business model is nothing new; he drew parallels to that model and Sears Roebuck's model of ordering via catalogs and picking up your product from your local Sears store. Mike brought up this story to discuss the importance of adapting to the current conditions, citing Sears’ inability to do so as one of its greatest downfalls and the reason it is not a major player in retail today. Mike spent time talking about how the information age has helped retailers to build better products, while also helping consumers make smarter, more informed decisions. Today, we are entering into a new era marked by machine learning, virtual reality, and artificial intelligence that Mike believes will impact the future of retail. Another important change has come in the way that signs are used. Today, digital signs incorporate instant visual changes based on data, which can be done from anywhere across the world with internet access. Mike believes that amidst these great changes, a successful business will be determined by who can adapt their technology to best satisfy the consumer need. One major change that Mike predicted in his own industry is the increasing use of virtual reality. Today, technology exists that allows customers to use virtual reality to see, in real-time, what a clothing item will look like on them without even having to try it on. Mike believes this new technology provides an opportunity for businesses to adapt and better serve consumers. Another area of the sign industry that Mike sees as an opportunity to adapt is in using data to inform sign displays. Retailers are working to create signs that can display tenant information, meaning that the display on a sign can be tailored to fit a specific audience. Furthermore, Mike discussed near field communication and the effects it will have on the future of the sign industry. He explained how, through near field communication, future signs will be able to detect your recent purchases and subsequently display an ad for what you might be interested in. With this consumer-specific technology, retailers must consider the importance of changing privacy settings on their signs. Though this was never an issue with the classic neon signs, retailers today must adapt to make sure that signs are password-protected and have software that allows only for administrator-approved changes. 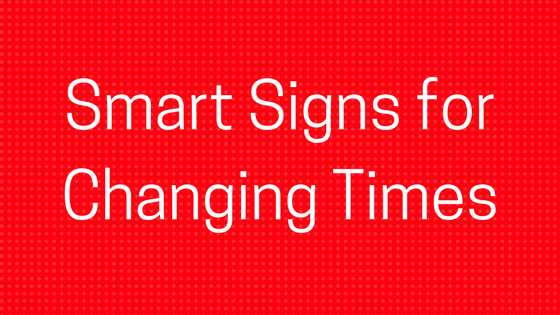 In the future, as the sign industry changes, it will be imperative for businesses to be flexible and adjust accordingly.